When it comes to the business of manufacturing motorcycles, the industry is littered with hits and misses. Some bikes come to market and completely miss the mark, while others are bang on the money and keep on achieving, year after year. Suzuki’s adventure duo, the DL650 and DL1000 V-Stroms, have just kept doing the business for the past 17 years, to the tune of selling almost 250,000 units worldwide in that time. Unlike the equally long-serving and successful DR650 and DR-Z400 trailbikes, Suzuki has bestowed the V-Strom with some fairly decent updates over their model life. In fact, last year the V-Strom range received a rather major overhaul, boosting their performance and specification levels while maintaining supreme versatility and value for money. 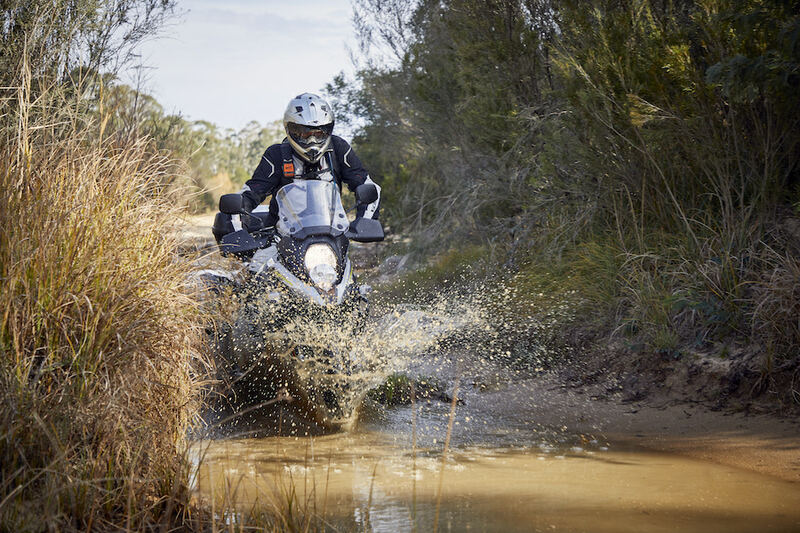 With its spoked 19-inch front and 17-inch rear wheels, the 650XT model here is the more dirt-worthy of the V-Strom DL650 line-up, which also includes a cast-alloy wheel model, and both come in LAMS guise. 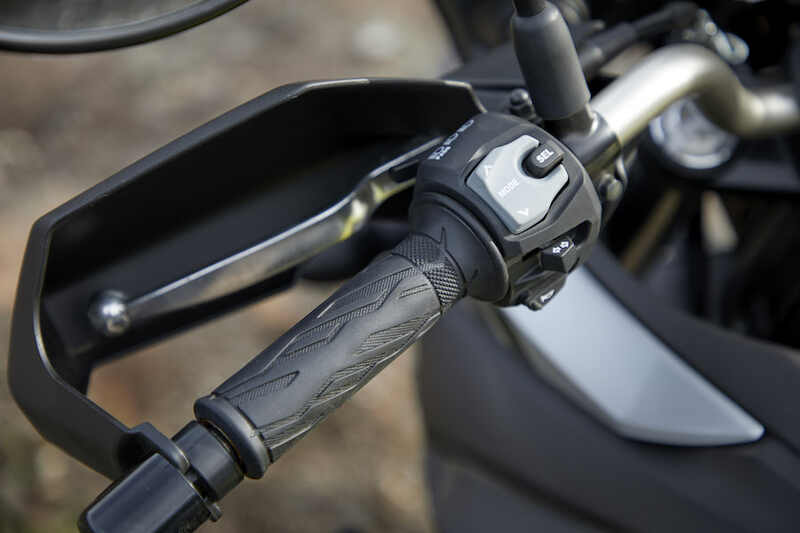 There are also cast-alloy and wire-spoked wheel variants of the larger-capacity DL1000 V-Strom. 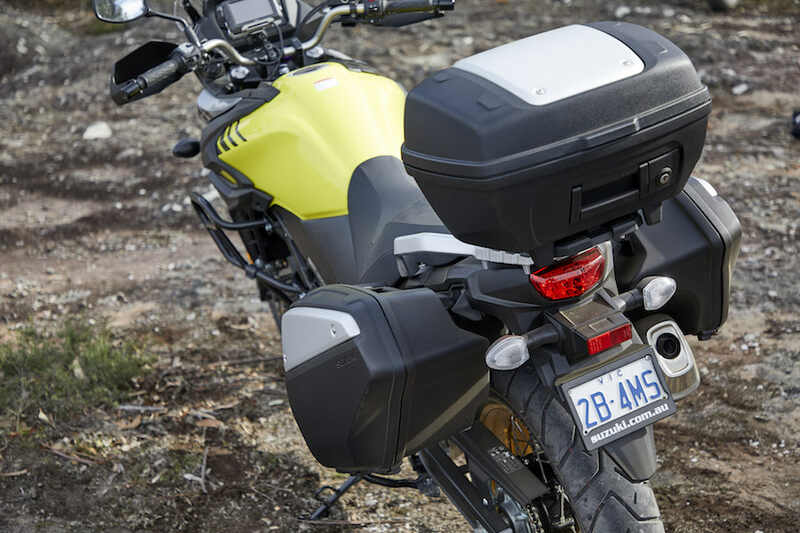 Appearing long and low, and loaded up with a genuine three-piece hard luggage set (panniers and top box), our V-Strom 650XT test bike certainly looked to be focused more towards the road end of the adventure riding spectrum, and once in the saddle that initial impression was confirmed as we kicked off our ride with a tarmac run down the NSW South Coast toward Braidwood. While performance is nowhere near as punchy as the bigger bikes, as you would expect, the Suzuki’s 645cc 90-degree V-twin powerplant is a sweet one. It’s lively and grunty enough on tight and twisty sealed roads, and doesn’t mind revving when the road opens out. 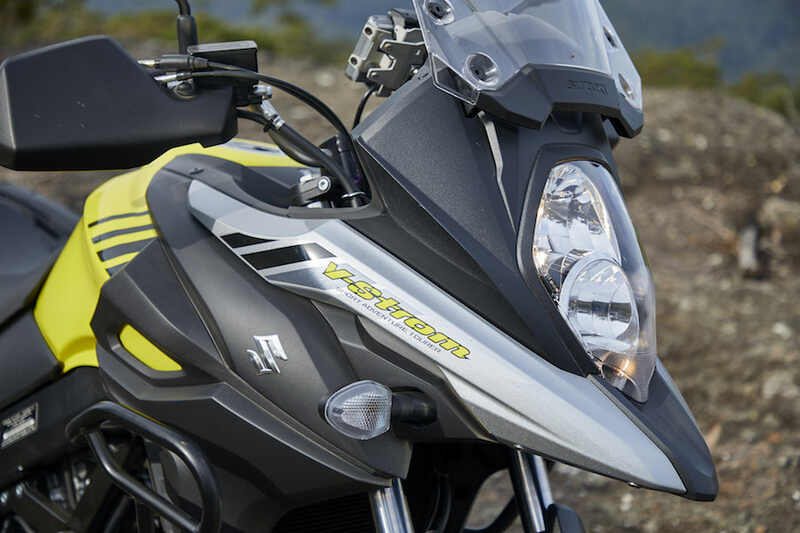 The motor has long been one of the best and popular features of the 650 V-Strom, and this latest unit, which has seen some 60 internal tweaks to boost performance and meet Euro 4 emissions requirements over the previous model, maintains the tradition. It purrs along at less than 5000rpm on the open road at 100km/h and has plenty more in reserve, and is well capable of carting around a luggage load and/or the missus – a task it will handle far more comfortably than a 650 thumper ever would. 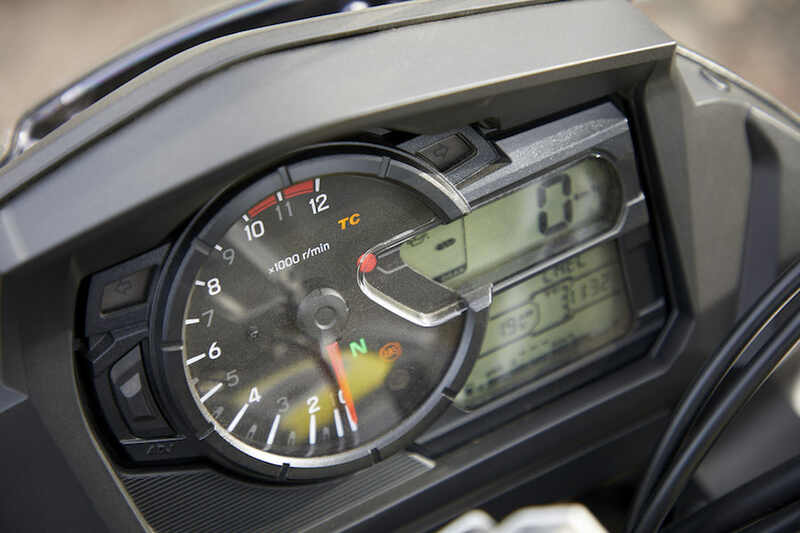 Handling is neutral and the V-Strom certainly benefits from a low centre of gravity, not just on the tar – where it stays planted to the road surface and will not only hold a steady line through the tightest of turns – but also on the dirt. This actually proved to be something of a revelation to all of us as we swapped between the bikes over the three days. In fact, it’s fair to say the V-Strom was a rather pleasant surprise on dirt roads, being able to cover ground more quickly and more comfortably than most of us anticipated. The Suzuki’s low feel and stable handling on dirt roads, along with its obviously lighter weight than the four 1000cc-plus bikes, was a definite confidence booster to riders with less dirt experience. 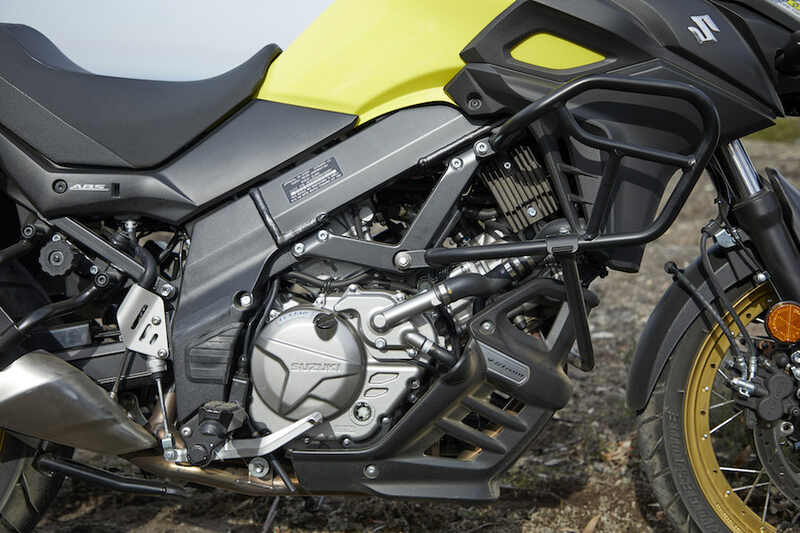 Delving deeper into the bush onto fire trails and twin-tracks began to push the V-Strom toward its limits, particularly with regard to the suspension action and low-riding belly, which is desperately crying out for more protection than the standard plastic cowling offers. Punching through a rocky river bed, I scored a howling wallop when the bike’s belly bottomed out on a submerged rock, and left me fearing I’d slammed the oil filter or engine sump. Inspection revealed the exhaust header pipes had taken the hit – phew! 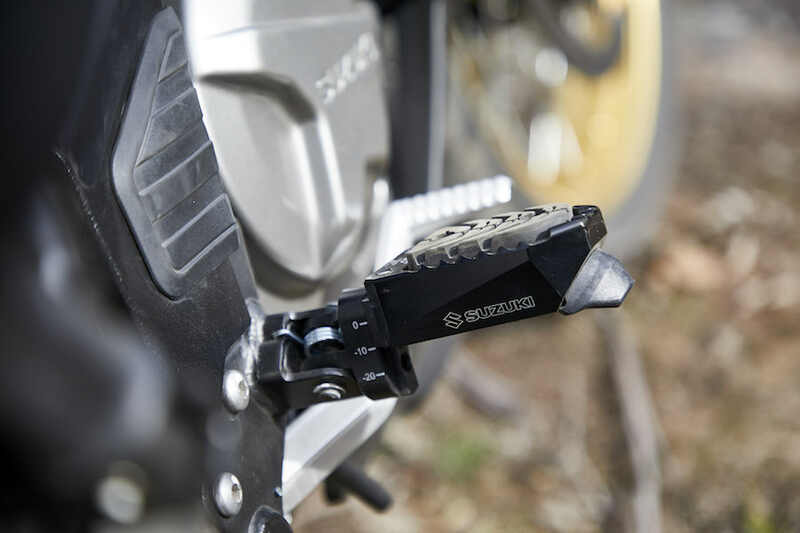 A metal bashplate and boosted suspension to help the bike ride higher and handle obstacles better off-road should be a high priority for any V-Strom owner intent on going bush. 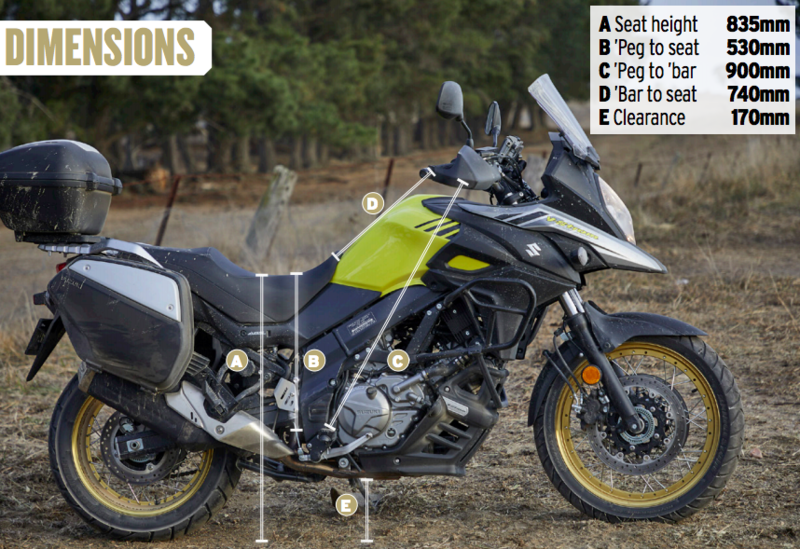 Bush tracks and loose and skatey surfaces also pushed the limits of the V-Strom’s ABS. The system kicks in at the drop of a hat and at times you would actually find yourself going faster when you wanted to be going slower. The system is not switchable, whereas the two-stage traction control is. The TC is also very intrusive when riding off-road, especially on corrugations, so we all switched it off for the dirt. 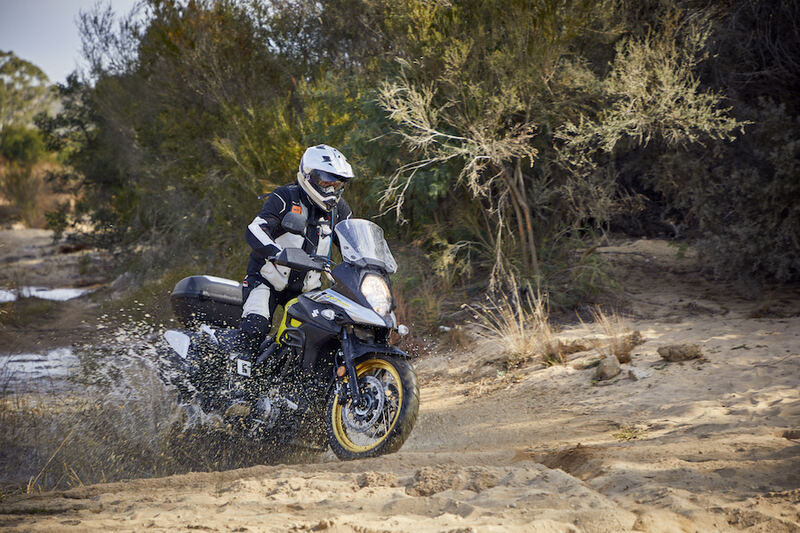 As an adventure machine, the V-Strom 650XT scores highly when it comes to versatility and value for money. Sure, it’s nowhere near being in the league of the barnstorming 1000cc-plus brutes we also had on this year’s ride (that’s a job for its big brother V-Strom 1000XT), as the V-Strom 650XT is way more Clark Kent than Superman. It’s a comfortable, well-optioned, all-roads tourer that carries a retail price of just $11,999 (plus on-road costs). And that represents a really well-priced admission ticket into Adventure Land by anyone’s standards. The V-Strom is a seriously good value-for-money mount that can do it all, on tar and dirt roads alike. It’s really easy to understand why Suzuki has sold so many V-Stroms over the past 17 years. The oil filter, sump and exhaust are only protected by a skimpy plastic cowling, and there’s not a lot of ground clearance. The ABS and traction control is pretty rudimentary on loose dirt. The latest V-Strom models take their styling cues from the mighty and memorable Suzuki DR Big models of the 1980s, the DR750 and subsequent DR800.